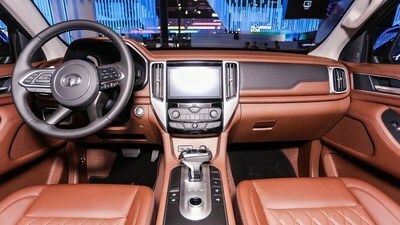 SHANGHAI, April 17, 2019 /PRNewswire/ — Great Wall Motors, China’s largest SUV and pickup manufacturer, has celebrated the world premiere of its P series pickup product line, which includes the passenger pickup, a cross-country pickup and a commercial pickup, at Auto Shanghai 2019. The three new stars from GWM’s new P series excel in terms of safety, smart features, weight, space and expandability. They were developed on GWM’s all-new P71 platform, a foundational advantage of which is the non-load bearing chassis. The three models are all-in-one designs that combine the comfortability and convenience of a sedan, the cross-country capability of an SUV, the leisure enjoyment of RVs and the loading capacity of light trucks. The P series products are designed for people who enjoy an upbeat, outdoor lifestyle as well as high-end business customers. The cross-country pickup includes professional configurations including differential locks in the front, middle and rear of the vehicle, snorkels, a winch, cross-country shock absorbers, crawl control and on-the-spot U-turn capabilities. 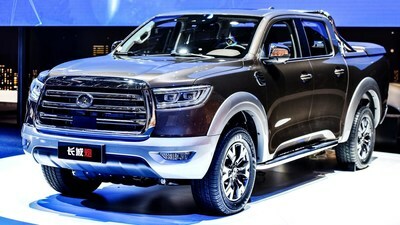 It has a fording depth of 900mm and is one of the most popular new releases at Auto Shanghai 2019. The cross-country pickup also has the boldest and most unconstrained exterior design with a thick grey plate running through the front grille and black uplift design on the engine compartment cover. The blackened wheel trims and front grille plus the rivets on the outside over the wheel trims all showcase the model’s masculinity. The commercial pickup, on the other hand, has a more delicate front grille design. In addition to the edition with leaf springs rear suspension, it offers the option of multi-link rear suspension. The model exhibited at Auto Shanghai 2019 is an electric version with original closed cargo, nominal range of 500 kilometers (310.69 miles), and high-efficiency charging, which can be completed in two hours. To fully carry out GWM’s clean energy strategy, the new pickups are currently offered in the pure electric versions, with the hydrogen fuel versions launching soon in the near future. The P series passenger, cross-country and commercial pickups mark GWM’s official entry to the international passenger pickup market to compete with the world’s leading brands. Founded in 1984, Great Wall Motors is China’s largest SUV and pickup manufacturer that owns two brands, Havel and Great Wall, covering the three product categories of SUVs, passenger cars and pickups. GWM has integrated global resources for innovative R&D a test center, trial-manufacturing center, modeling center and power center that meet global standards.